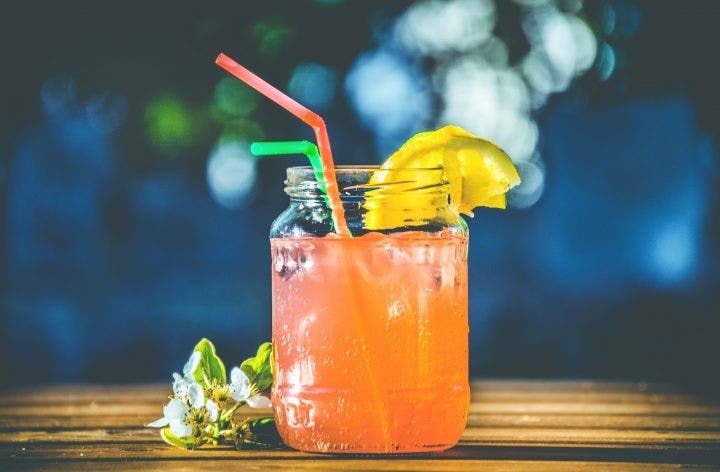 Juices are satisfying drinks that can end your thirst or refresh you after a long day.These are made by extracting the natural juices or liquids from a fruit and processing the extracts to become safe for human consumption. You may also see Vintage Menu Design. If you happen to own a juice bar, make sure you grab the attention of customers by showcasing your juice products in attractive, colorful ways. 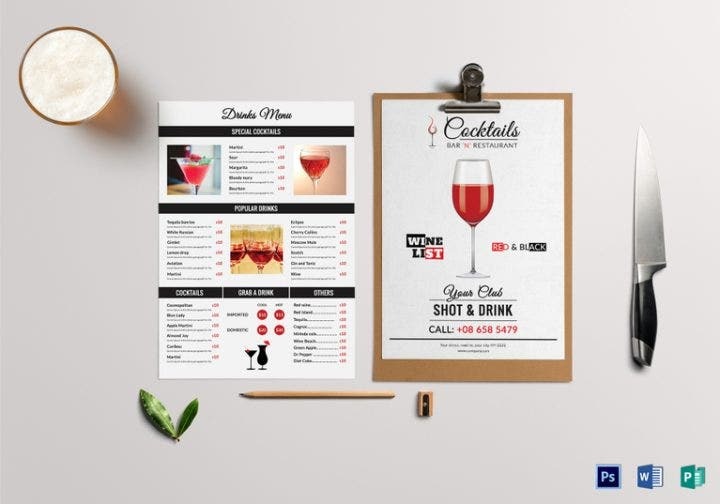 For instance, feel free to go over these juice menu templates and choose the right one for your business. You may also see menu design templates. The dominance of orange in this template is so attractive that will definitely make people take a second look at your menu template. If you purchase the template, you will get two Photoshop Document (PSD) files that can be edited in Adobe Photoshop CS3. This flyer template has front and back designs, and all the text are editable. It also has the CMYK color model so you can be sure that you are getting true-to-life colors for your template. 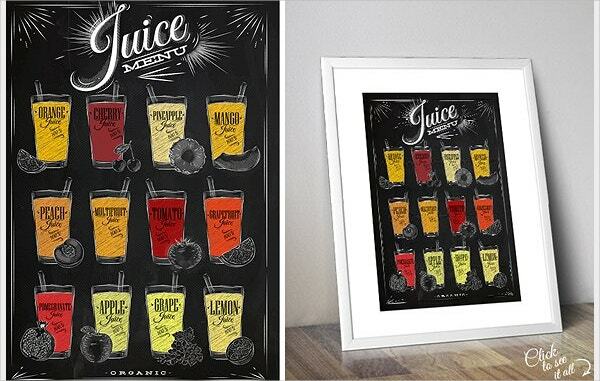 This collection of juice posters is drawn on dirty paper template, chalkboard menu design, and kraft paper. The fonts are located in a separate Adobe Illustrator file with editable texts. Get this template today if you want a cool, retro-looking vibe for your menu. With its brightly colored and nicely drawn images, this template easily attracts the eyes of customers. 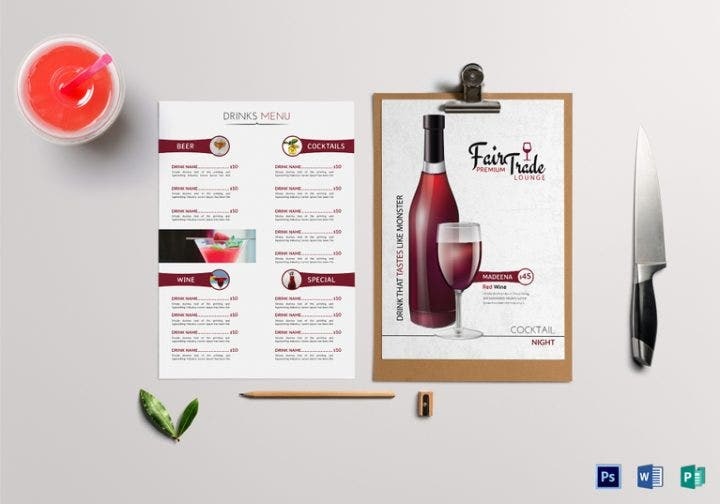 So, get it for your juice bar or restaurant menu template today! This template feels just right for the summer. It has a beach vibe and seashell design which makes it adorable. 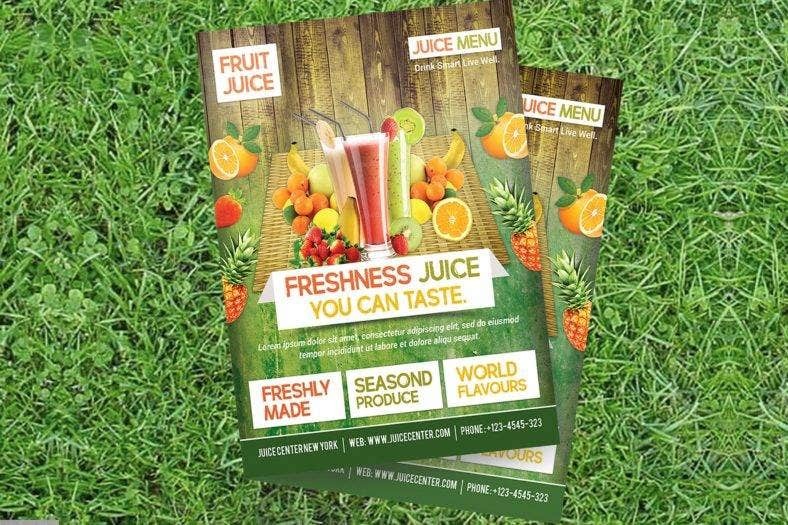 Get it now if you have a juice bar that is located by the seashore.You may also see Menu Design Templates. 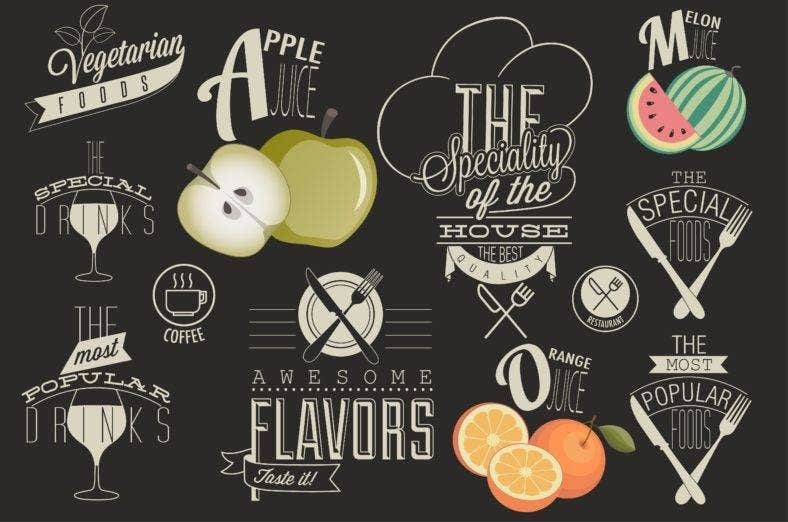 If you want another juice menu drawn on a chalkboard menu templets, then this template is a great choice for you. Every kind of juice drink you want to offer can fit in this template. The illustrations are drawn in a charming, detailed manner that will surely fit any restaurant theme or ambiance. 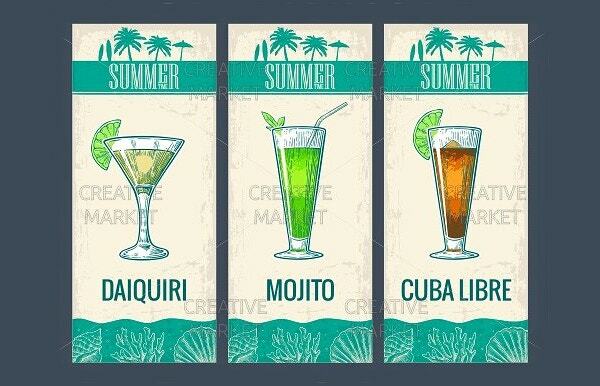 These beautiful retro vintage logos design are perfect for any juice bar. It features colorful illustrations designs and stylish-looking fonts, making the template easily stand out against others of its type. If used for a juice bar menu designs, the background has to be lightened up a bit. It measures 8.27 inches by 11.69 inches and can be edited on Adobe Illustrator, InDesign menu designs, Microsoft Word, Photoshop, and Publisher. 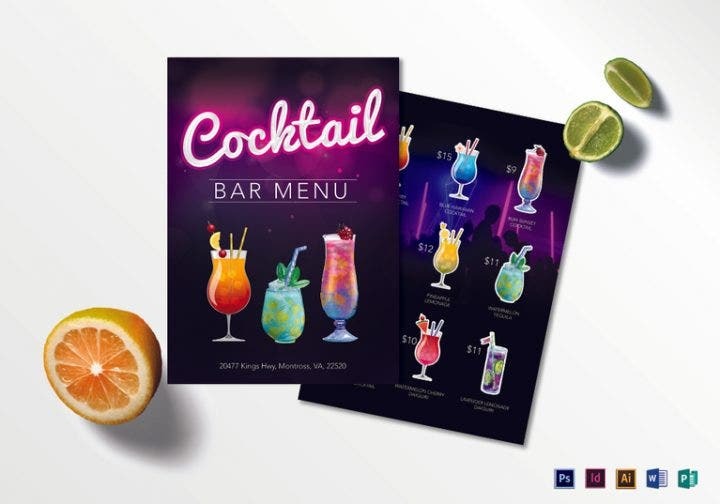 Purchase this template now if you are running a club that serves fruit-based cocktails. Just like the other template, the background needs some lightening up if you intend to use this as a juice pub menu template. Photos may also be added, but keep things minimal so you can preserve the template’s appeal. 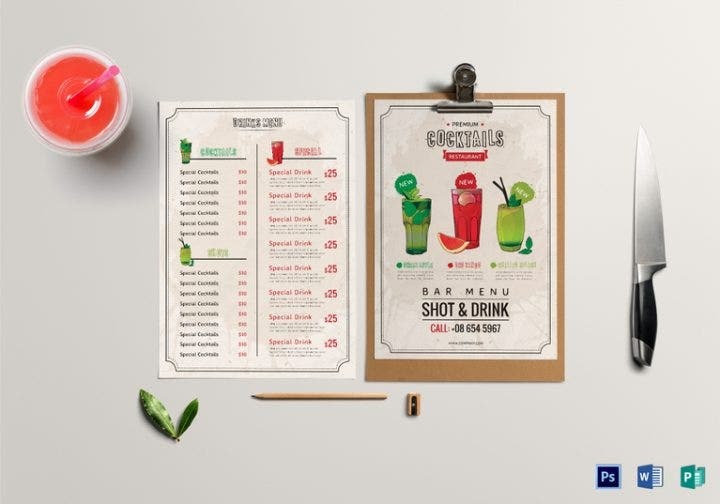 With its clean, white background, this template can be used for juice bar menus. Only a few photos can be added, so it will not take up so much space. You may also see Cafe Menu Templates. Illustrations with an off-white background would do very well as a juice bar menu templates if you wish to adopt a minimal aesthetic. This template can be edited using Microsoft Word, Photoshop, and Publisher. 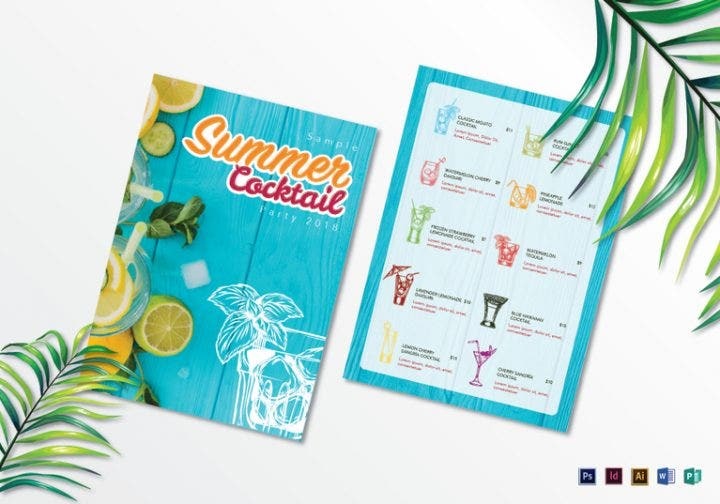 This template features another summery vibe that fits a juice bar menu design. It can be customized using Adobe Illustrator, InDesign, Microsoft Word, Photoshop, and Publisher. You may also see Menu Templates. This minimalist website template works well for juice bar menus. For this, you can add a handful of good-looking photos and position them throughout the template. It has editing compatibility with Microsoft Word, Photoshop, and Publisher. You may also see Price Menu Templates. Know how it works. Before anything else, you should know how a juice bar works both inside and outside. 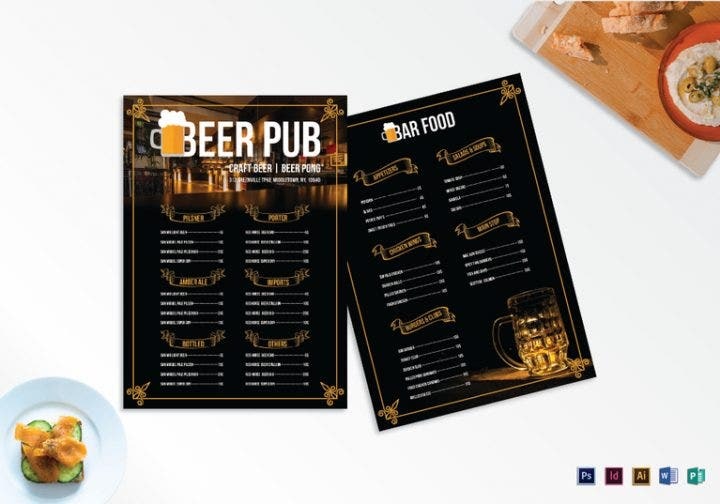 You should learn the basics of running the bar as well as how to get ahead of your competitors.You may also see Beautiful Restaurant Menu Designs. Make a business plan. After learning the basics of running a juice bar, it is time to make a business plan. In your plan, you have to include the operating costs, target market, location, permits, and licenses. 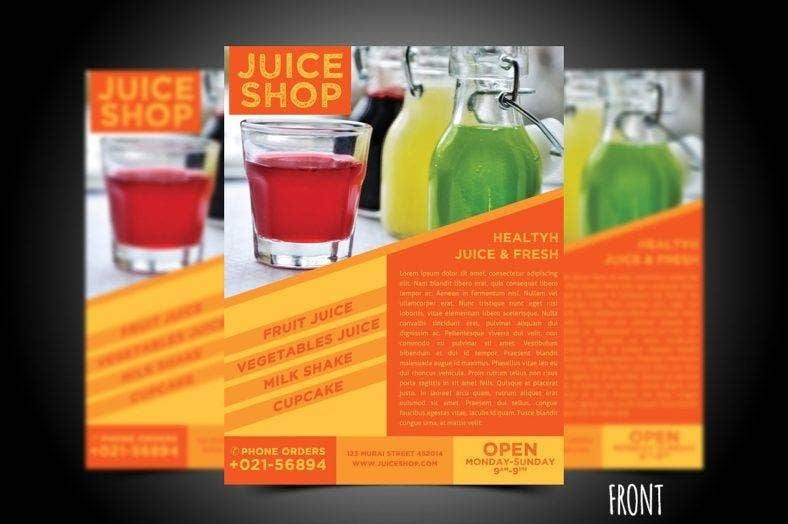 After completing your simple business plan, you will be better equipped to handle the process of starting up a juice bar.You may also see Creative Restaurant Menu Designs. Create a budget. Know how much setting up a juice bar costs. If you are getting a franchise from a certain brand, the initial cost may be high, but you will not have to worry about the equipment and the supplier since your franchise agreement would cover those things. If you are setting up a brand new juice bar based on your own idea, you have to think about the rent, labor costs, equipment, marketing, utilities, ingredients, etc. You may also see Free Menu Template. Find a location. Whether it is in the heart of the city or some streets away, the location of your juice bar is important. It has to be accessible to people. You also have to consider the parking space when looking for a location. You may also see Catering Menu Templates. Think of what kind of juice to offer. Be creative. There are a lot of juices, but which ones do you want to offer? Do not limit yourself to offering only one kind of juice. Offer other fruit-related products so people will have a variety of choices.You may also see Breakfast Menu Templates. Find suppliers. You need to find the right suppliers for your juice bar. Make sure they have fresh and quality produce that you can use. These suppliers should also be able to provide you with the ingredients you need on a daily basis. 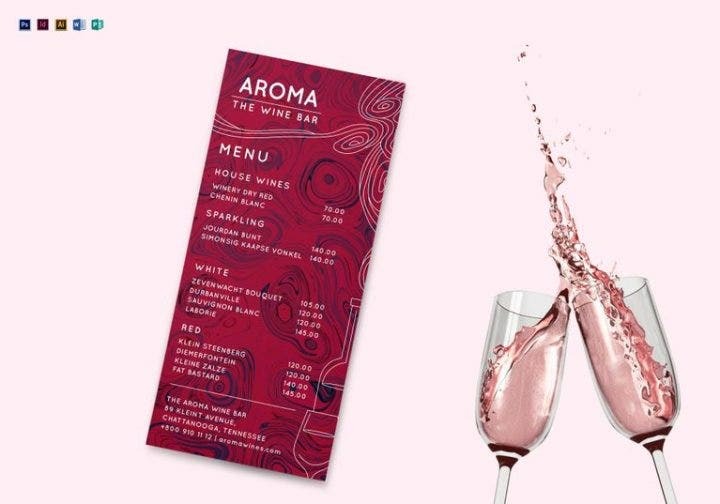 You may also see Best Wine Menu Designs. Promote the juice bar. This is where the marketing part comes in. Promote your juice bar through social media like Facebook, Twitter, and Instagram for a bigger reach.You may also see Cafe Menu Templates. Grand launching. Once everything is set, prepare for the grand launching. Your juice bar is ready for operations. You may also see Coffee Menu Templates. Designing a menu template is never easy. Some problems may arise, but it is your persistence that will eventually make you finish what you started. 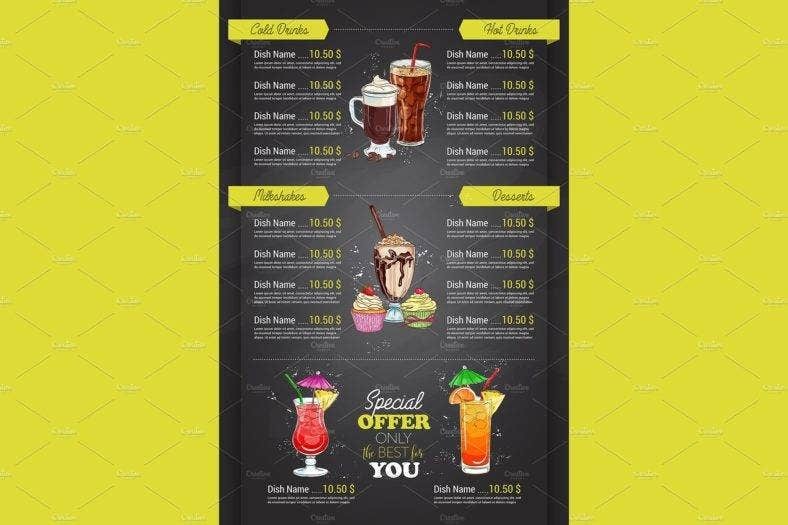 If you believe you do not have the creativity to design your own menu template, then consider purchasing one from the list we have presented in this article. Have fun shopping for a juice bar menu template! 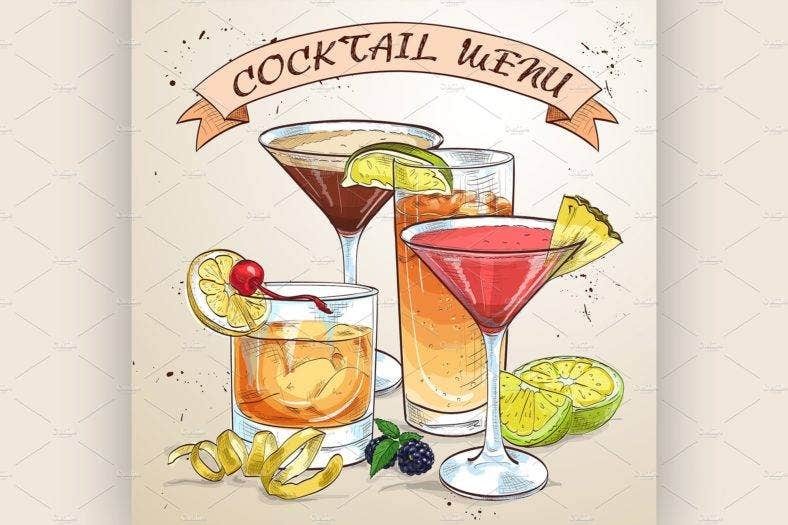 You may also see Cocktail Menu Template.